Bar Stools come in the classic dark finish espresso bar stool style and are “bar height” (see picture below). 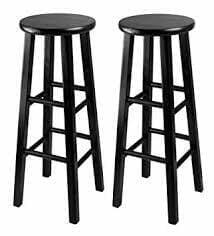 These stools pair well with 42″ tall x 30″ or 36″ cocktail tables (Hi-Tops). Please see our High Top Tables here. Give your guests the full bar experience in your home or at your event in Santa Barbara, CA with these classic bar seats. Functional yet comfortable, these stools offer guests a place to sit and rest. Because the stools are easy to move, you can configure and re-configure for different social groupings at your party with ease.